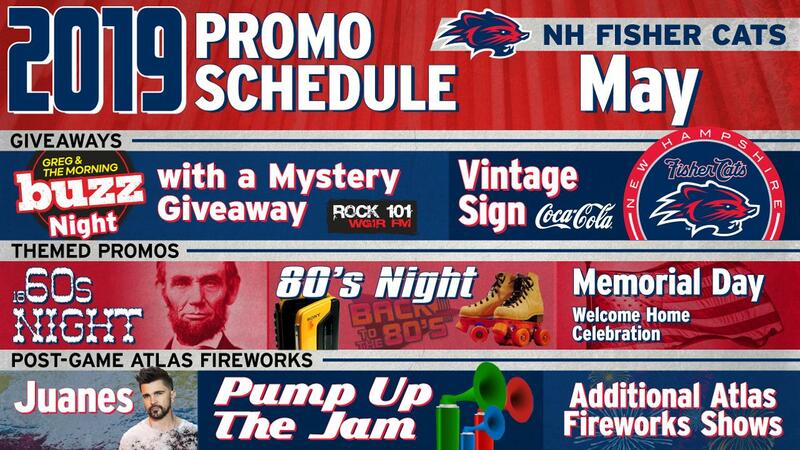 Check out the Fisher Cats Promos for May 2019! Get there early for that mystery giveaway, and stick around after the game for Atlas Fireworks! The Colombian superstar won't be here in body, but his tunes will be the tracks for a spectacular Saturday night fireworks show. ¡Tenemos la camisa negra! This giveaway is so metal… literally! The first 1,000 fans in attendance will take home a metal Vintage Sign that will undoubtedly complete any She Shed or Man Cave. Citizens of the Internet, rejoice! The series of tubes we all can't seem to live without has produced some of the best (and worst) humanity has to offer, but this night is all about celebrating the true "raison d'etre" of the World Wide Web: MEMES. From Grumpy Cat to Doge, All Your Bases Belong To Us to the Rickroll, we'll be celebrating the cultural phenomenon that has all of us wanting to be like Good Guy Greg and not Scumbag Steve. Ermahgerd! Break out your petticoats and top hats! We're rolling it aaaaaall the way back to the 19th century for a night of old-fashioned fun. After a rousing success last season, S.T.E.M. in the Stadium returns on Manchester Schools Day this year. National and regional organizations that promote Science, Technology, Engineering and Mathematics will be on hand to share the joys of learning with thousands of Granite State children for this special 10:35 a.m. game. Does a secret global conglomerate control the puppet strings of our society? Or are the Lizard People posing as our world leaders really the ones in control? We'll tackle conspiracies big and small all game long, while perhaps creating a few of our own along the way… Assume nothing, question everything. Higher education comes to Northeast Delta Dental Stadium! Join us for a celebration of the Class of 2019 as they leave high school and embark on the next chapter of their lives. Everyone's favorite decade, done Fisher Cats-style. Need we say more? Win or lose, we'll be PUMPED UP after the game thanks to the tunes from this themed Atlas Fireworks show. A perennial fan favorite, we'll spend the afternoon paying homage to the men, women and children who sacrifice so much to keep our country safe. Our alter-ego returns for the two Sunday games this month, and all kids are invited to run the bases after each Sunday home game. Two Tallboy Tuesdays and a pair of Thirsty Thursdays are on deck in May.